Hey fans, We start our final series in this homestand tomorrow agains the Lynchburg Hillcats. 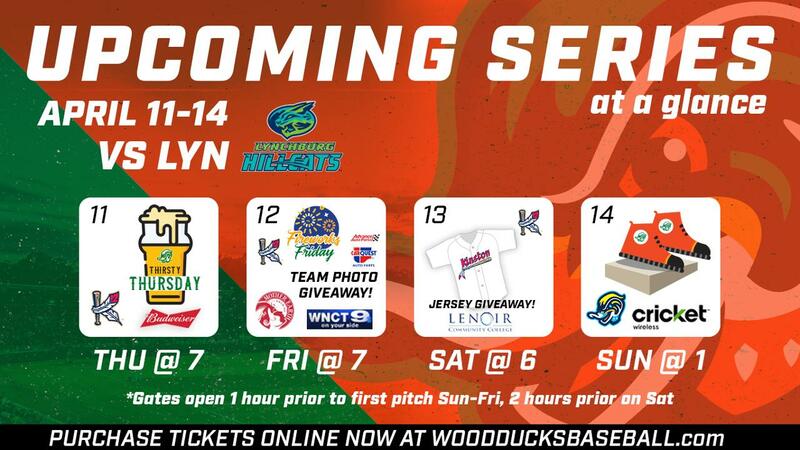 This series is the first of two Throwback weekends so the Wood Ducks will be playing as the Kinston Indians on 4/11-4/13! Thursday, April 11th Thirsty Thursday presented by Budweiser, we will have $1 Busch Light 12 oz cans and $1 Natty Light 12 oz cans! The ballpark gates will open at 6pm and the first pitch will be at 7pm. Friday, April 12th is Mother Earth Friday, bring a beer can to the ticket booth and receive $3 off your game ticket presented by Mother Earth Brewing. We will be doing The 2019 Team photo giveaway presented by Advance Auto & Carquest of Kinston for the first 2,500 fans! We are also bringing back Food Truck Fridays this season as well! What's the Dilla? and Urban Street Eats food trucks will be on site, but not only that, you can visit the 3rd base concession stand and try all of our Food Truck style foods such as chicken and waffles and fried Twinkies! To top the evening off right, stay after the game and enjoy Fireworks Friday presented by WNCT 9 on your side. The gates will open at 6pm and the first pitch is at 7pm. Go Wood Ducks! Saturday, April 13th is Pepsi Saturday, bring a Pepsiproduct to the ticket booth and receive $3 off your game ticket presented by Pepsi. We are also giving away Kinston Indians jerseys to the first 1,000 fans presented by Lenoir Community College so you are going to want to get here early for this one fans! The gates will open at 4pm and the first pitch is at 6pm. Stay after the game and watch Back to The Future Part 1 in the outfield so make sure and bring your blankets (chairs will not be allowed on the field). Sunday, April 14th we will be playing as Patos Joyuyos! In order to celebrate local hispanic culture we will be playing in alternate uniforms. There will also be quite a few changes around the ballpark that you'll notice such as music and new on field promotions to celebrate! Sunday Funday is back this season as well presented by Cricket Wireless of Kinston! We will have pre game autographs and after the game, all the kiddos get to run the bases like a player! The gates will open at 12pm and first pitch is at 1pm. Get your tickets now! Go Ktribe!